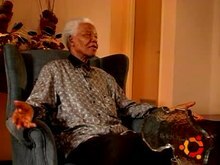 Nelson Mandela notionem ubuntu explicat (Anglice). Ubuntu (Zulu/Xhosa [ùɓúntʼú]), sive uMunthu (Chichewa), est ethica vel humanistica philosophia ex Africa Austrina exorta, quae ad fides et fraternitatis coniunctiones hominum inter se spectat. Nonnulli credunt ubuntu esse philosophiam vel sententiam mundi Africanam classicam; alii autem dicunt id esse notionem quae in fontibus scriptis per alterum saeculi vicensimi dimidium evoluta est. Vocabulum ubuntu ex linguis Bantu Africae Austrinae deducitur. ↑ Dion Forster, Self validating consciousness in strong artificial intelligence: An African theological contribution (2006), www.spirituality.org.za. Ambrose, David. 2006. Your Life Manual: Practical Steps to Genuine Happiness. Revolution Mind Publishing. Bagley, Elizabeth Frawley. Remarks at Swearing-in Ceremony of Special Representative for Global Partnerships Bagley: Opening Our Doors to the Private Sector U.S. Department of State, Global Partnership Initiative. Battle, Michael. 2007. Reconciliation: The ubuntu theology of Desmond Tutu. Pilgrim Press. ISBN 9780829811582. Eze, Michael Onyebuchi. 2010. Intellectual history in contemporary South Africa. Palgrave Macmillan. ISBN 9780230622999. Forster, Dion. 2006. Self validating consciousness in strong artificial intelligence: An African theological contribution. Dissertatio doctoralis, Universitas Africae Australis / UNISA. Forster, Dion. 2006. "Identity in relationship: The ethics of ubuntu as an answer to the impasse of individual consciousness," paper presented at the South African science and religion Forum. Gade, C. B. N. 2011. The historical development of the written discourses on ubuntu. South African Journal of Philosophy 30(3):303–329 . Kamwangamalu, Nkonko M. 2008. Ubuntu in South Africa: A sociolinguistic perspective to a pan-African concept. In The global intercultural communication reader, ed. Molefi Kete Asante, Yoshitaka Miike, et Jing Yin, 113–122. Novi Eboraci: Routledge. Louw, Dirk J. 1998. Ubuntu: An African Assessment of the Religious Other. Twentieth World Congress of Philosophy. Matshe, Getrude. Born On The Continent – Ubuntu. A se editus. Metz,Thaddeus. 2007. Toward an African Moral Theory. South African Journal of Philosophy 26(4). Ramose, Mogobe B. 2003. The philosophy of ubuntu and ubuntu as a philosophy. In The African philosophy reader, ed. P. H. Coetzee et A. P. J. Roux, ed. 2a., 230–238. Novi Eboraci et Londinii: Routledge. Samkange, Stanlake J. W. T., et S. Samkange. 1980. Hunhuism or Ubuntuism: A Zimbabwe Indegenous Political Philosophy. Harare: Graham Publishing. ISBN 0869210157. Swanson, D. M. 2007. Ubuntu: An African contribution to (re)search for/with a “humble togetherness. Journal of Contemporary Issues in Education 2(2). Special Edition on African Worldviews. Situs interretialis. Swanson, D. M. 2009. Where have all the fishes gone? : Living ubuntu as an ethics of research and pedagogical engagement. In In the spirit of ubuntu: Stories of teaching and research, ed. D. Caracciolo et A. Mungai, 3–21. Transgressions: Cultural Studies and Education, eeries ed. Shirley Steinberg. Rotterdam, Netherlands: Sense Publications. PDF. Swanson, D. M. 2010. Value in shadows: A critical contribution to values education in our times. In International research handbook on values education and student, ed. T. Lovat et R. Toomey, 137–152. Wellbeing Novi Eboraci: Springer Press. Tutu, Desmond. 1999. No Future Without Forgiveness. Novi Eboraci: Random House. Novissima mutatio die 18 Iulii 2018 hora 15:39 facta.